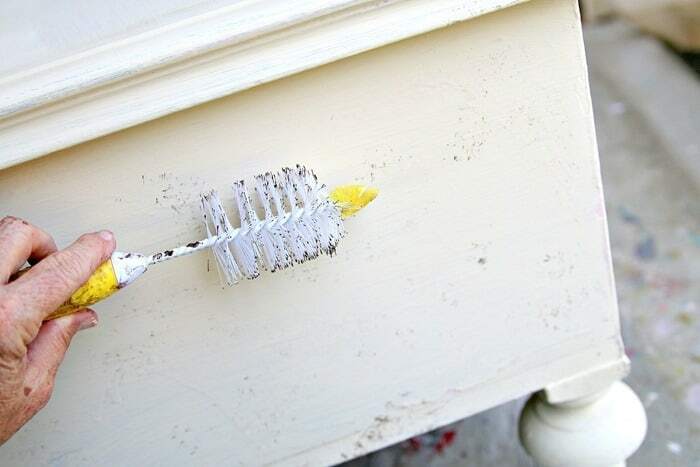 I found new tools to age painted furniture….straight out of my kitchen drawer. You guys are going to love this. 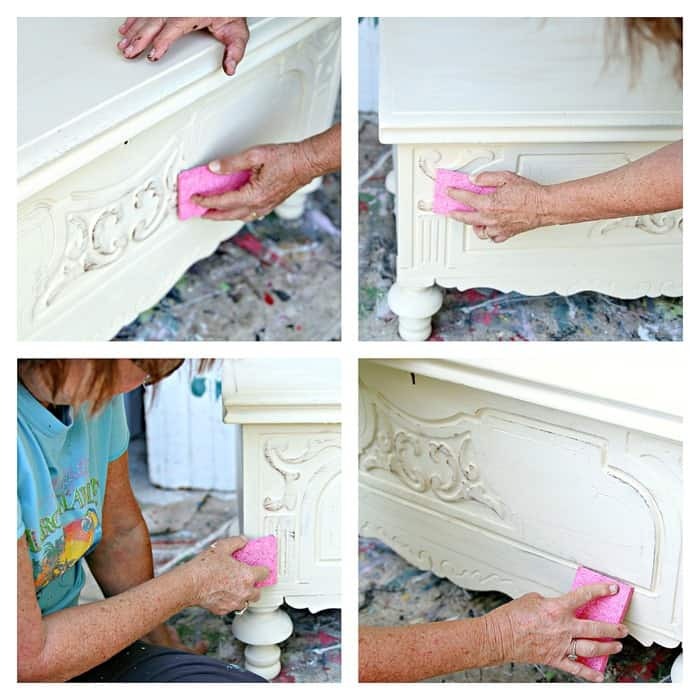 I painted a horribly worn cedar chest using my new tools and I’m sharing the whole process with you. The technique is so easy I know you’ll want to give it a try. 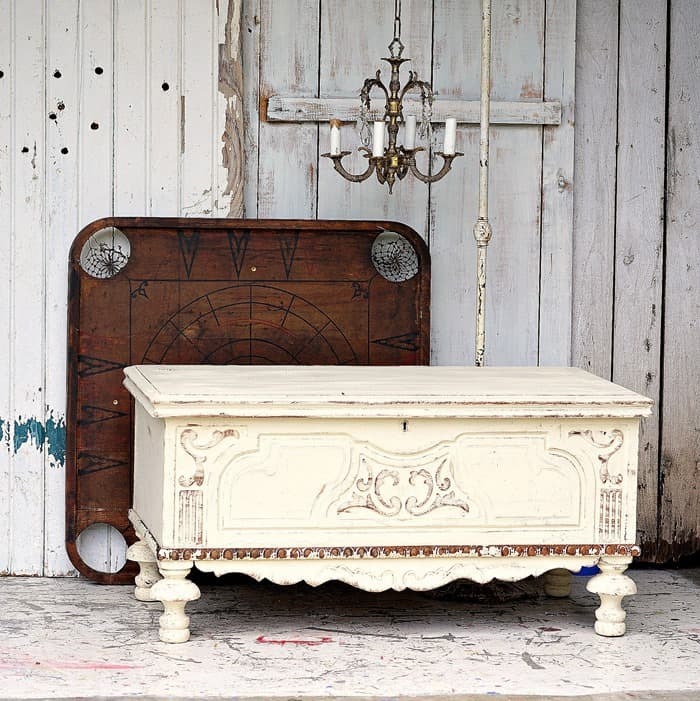 I love white paint that has a bit of distressing and antiquing and aging. It brightens up any room. This is how the chest started out. It was “antiqued” back in the ‘60’s. At least that’s what I was told when I bought it. The shop owner purchased several pieces from an estate and the lady said she personally painted all of them. I remember when my Mom “antiqued” a bedroom suite avocado green. 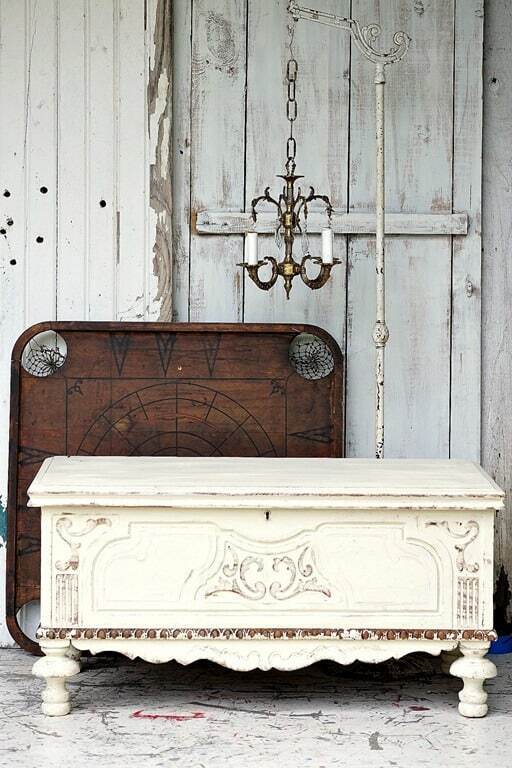 The chest was $40 and even though it was in sad condition the carved wood details were too lovely to pass up. I had to do a lot of prep work in order to repaint the chest. The new paint color is very similar to the old but what a difference. And the process was so easy. 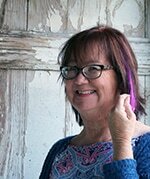 The carved trim around the bottom of the chest was my inspiration for the makeover. Most of the paint popped off when I cleaned the trim and the wood was so nice I didn’t want to paint over it. I carefully removed the trim pieces (marking them for replacement) before painting the chest. My plan was to paint the chest off white to match the trim. That means I would need to antique or age the paint somehow. 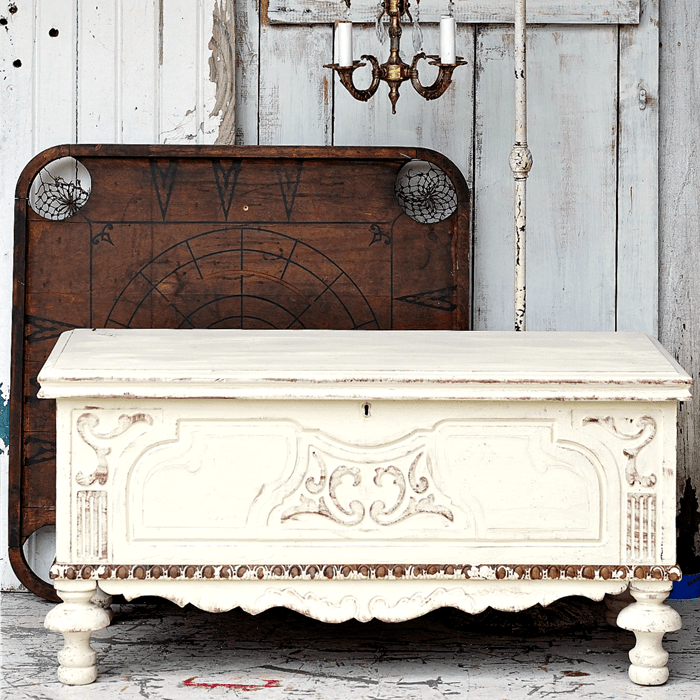 I chose FolkArt® Outdoor Acrylic Paint in Off White for the chest. 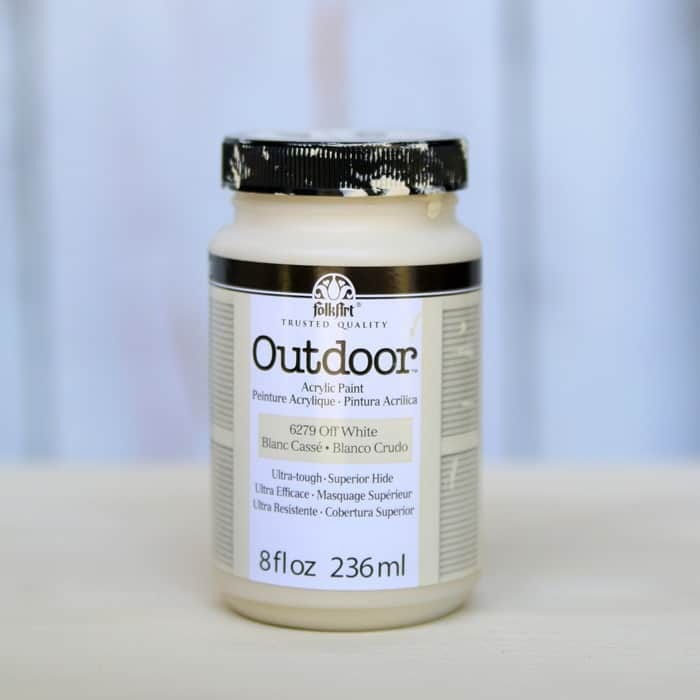 The paint was made for outdoor use but can also be used for indoor projects. I like the way it brushes on and I really like the sheen….not too shiny…..just right, and no sealing required. The Off White was a good match for the paint on the trim. 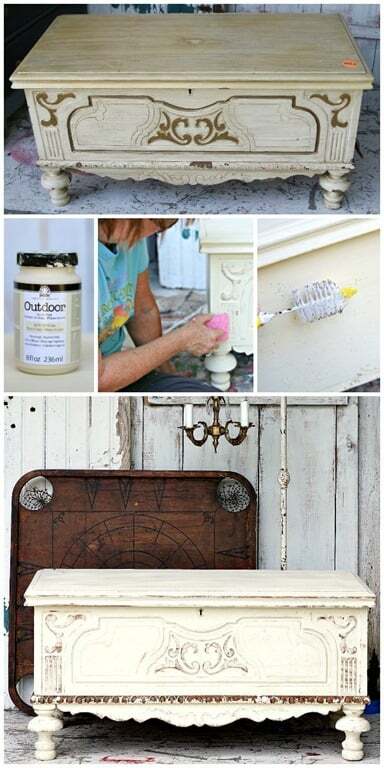 These are my new favorite tools to age painted furniture, a sponge and a bottle brush. The bottle brush is left from the days our Sofi was a baby. She will be 6 next wee. I modified the paint brush by cutting off the large foam tip. We don’t need that. 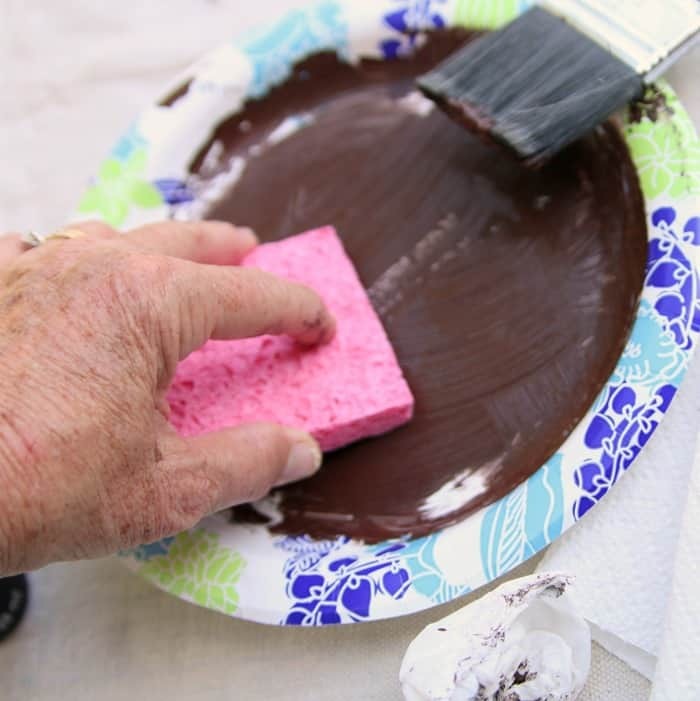 To use the bottle brush to age the cedar chest I first poured FolkArt Multi-Surface Acrylic Paint, color Burnt Umber, onto a paper plate. I then spread the paint in a thin layer using a paint brush. Next I twirled the bristles of the brush in the paint and dabbed off the excess on a paper towel. Now comes the fun part! I just touched the brush to the chest and ta-dah, tiny dots of paint. The dots look natural because they are really small and look like age spots or areas of missing paint. I went over the whole chest dabbing the paint on randomly. I tried not to overdo it. 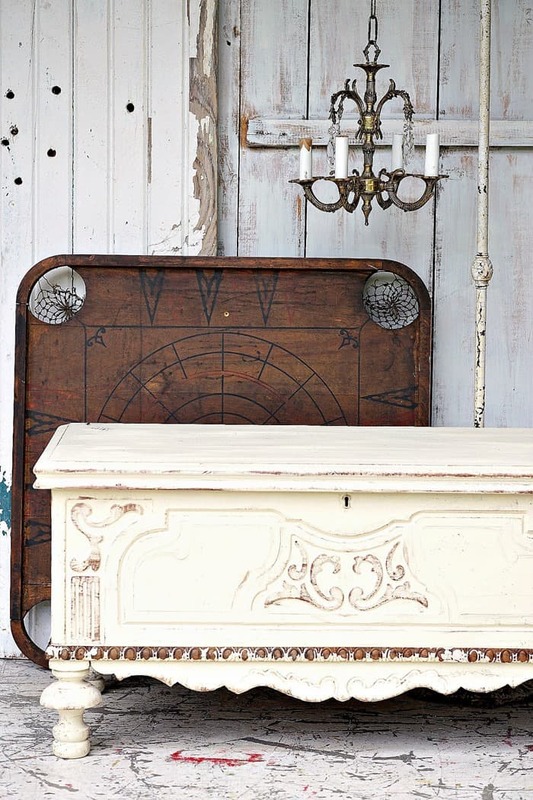 It’s always best to start out with less and then add more later if you decide it’s not “antique” enough. Now we move on to the sponge distressing or dry brushing. I’ve never used a sponge to dry brush so I guess we call it dry sponging? Did I just invent a new term. Funny. I dipped one edge of the sponge in the paint then dabbed the excess on a paper towel. Here comes the fun part again. I ran the sponge over all the raised details, chest edges, and the legs. I added more paint to the sponge as needed. Again, start with less, then add more if needed. I actually did add more before the project was completely finished. When I nailed the original trim to the chest when the paint job was finished I took a step back to look at the project and decided the colors were a little off balance. There was a lot of the dark wood showing on the trim so I added more paint to all of the details to balance the dark wood. I really liked the sponge to “dry brush”, maybe more than than using a brush. 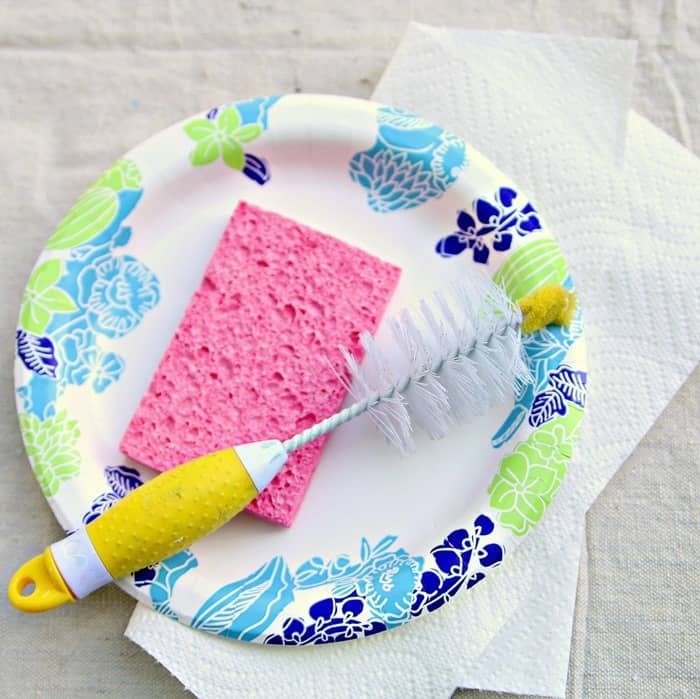 I have more control with the sponge because it’s flexible and doesn’t have all those bristles going every which way. I was able to bend the sponge to work around the curved details. Easy. Then I was done. I have to admit to doing the happy dance and patting myself on the back a lot. Now I want to keep the cedar chest instead of selling it. What to do, what to do. The original chippy wood trim is the focal point and man is it pretty. What do you think? Did I do good? 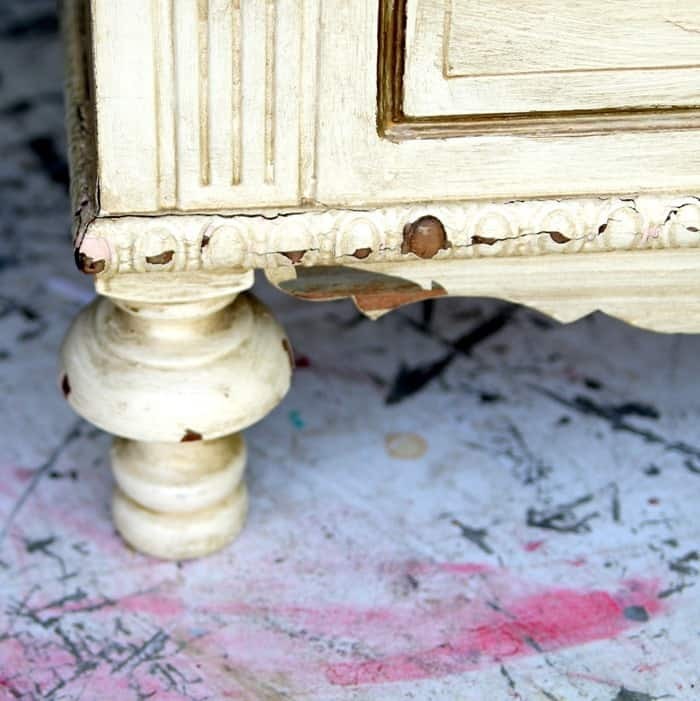 This technique to age painted furniture is now officially my favorite paint technique. Don’t forget to pin the project. 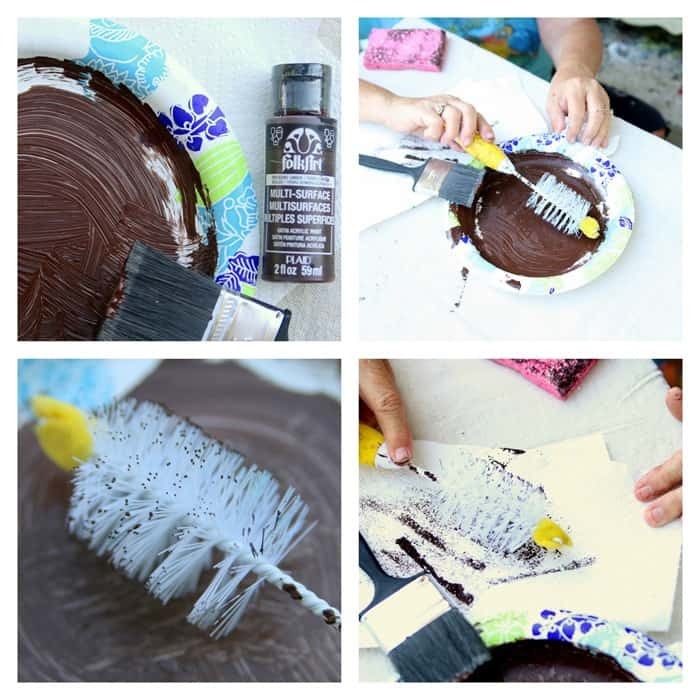 This is such an easy technique and can be used on any painted surface such as painted signs, outdoor décor, etc. For additional information on the FolkArt Outdoor Paint click here. You might remember my stenciled jewelry box project from last week. I used the FolkArt Outdoor paint and selected several bold colors for the stencil design. The Outdoor paint is available in 17 colors. Sign up for the Plaid Newsletter and follow Plaid on Facebook and Pinterest for the latest ideas and trends. Disclosure: This post is sponsored by Plaid Crafts as part of the Plaid Creators program. All words, project ideas, and photographs are 100% my own. Oh eeeeem gee, I’m just bowled over by how you did this Kathy. It looks beautiful. Thanks Michelle. I surprised myself too. Hi! 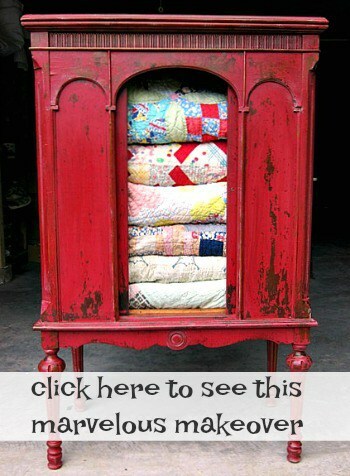 I could not be more thrilled I found your blog! Going to use ALL these ideas! Quick question…did you sand before painting with this particular paint? I DESPISE sanding so fingers crossed the answer is no! Thanks so much again! Hi Kirsten! I’m glad you found my blog. I have the best readers and support group! I did sand this piece but only because there was so much loose paint. I normally don’t sand. Hope this helps. It’s gorgeous and I’d want to keep it too. You have the right touch! Love this project and tips. Thank you for sharing with us at Merry Monday. I always love your creativity. Now I’m looking for a bottle brush project! Turned out wonderful! I will be trying this out to see if it works for me. Thanks! I love all of your ideas & seeing the how to’ S& end results but there are so many ads & your site takes so long to load that it gets very frustrating, so I close your site more than half the time. To leave this comment took 4 x’s & the site is still trying to load! Kathy, you totally should be doing a happy dance and patting yourself on the back!! 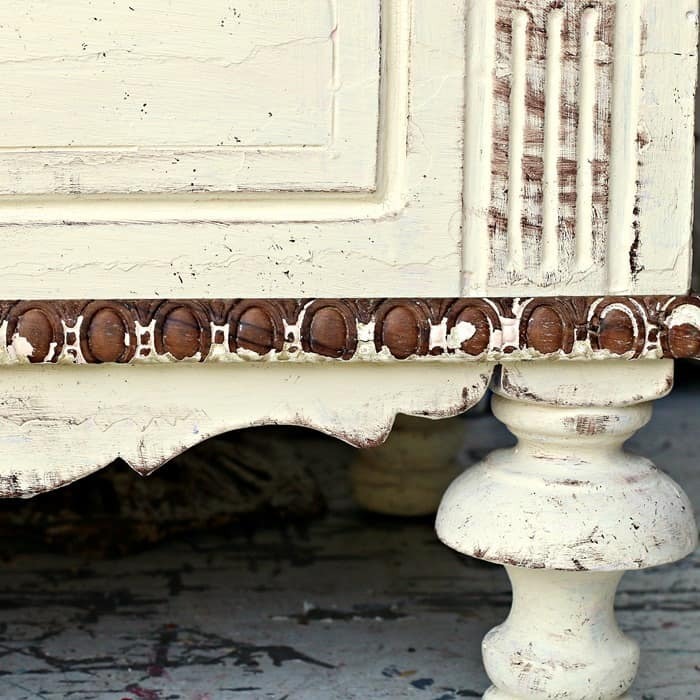 Such a beautiful way to age furniture!! Your chest came out so beautiful! Wow! Can I send my piano your way?!!! You are so talented with paint!!! That is a lovely piece! And your paint job is beautiful. My mom “antiqued” a mission oak desk avocado green with a gold overcoat. Apparently, that was the thing to do. This paint is going to get removed, and the desk will be restored!!! At this point, the desk is over 50 years old. I used it to do my homework on as a child and as an adult. It’s become rickety, so as soon as I clear the garage out, it will be my first furniture project. Wow, that’s going to be a job. Good Luck. I’m glad you still have the desk. Memories. So funny that you should mention the avocado green! My mother passed away 33 years ago but I have a cedar chest she antiqued avocado green when I was small. Have thought about changing that but I think I’ll keep it like it is! It’s in my closet so no one sees it but me anyway. I would probably leave as is too. WOW! This painting technique looks like a lot of fun. I have already tried your dry brush and couldn’t be happier with the results. How did you ever come up with a bottle brush??!! Brilliant my dear! Yep, that’s me, brilliant, lol. I just found the brush and the idea came from there! Glad you tried the dry brushing! You did a good job distressing this piece. Its a keeper. I’ts absolutely beautiful……….I would have to keep it! Your work is so inspiring. a old wooden love seat that has worked great detait’s, that I want to bring out. Looks great! I suggest you keep it. I would love to. Have to find a place for it. Looks sooooo great I love it. AND that old game board behind IT! Did you find that at one of your shops? Yes, I did Mimi. But it was a long time ago. Sometimes I put it on my mantel. Glad you like the transformation. 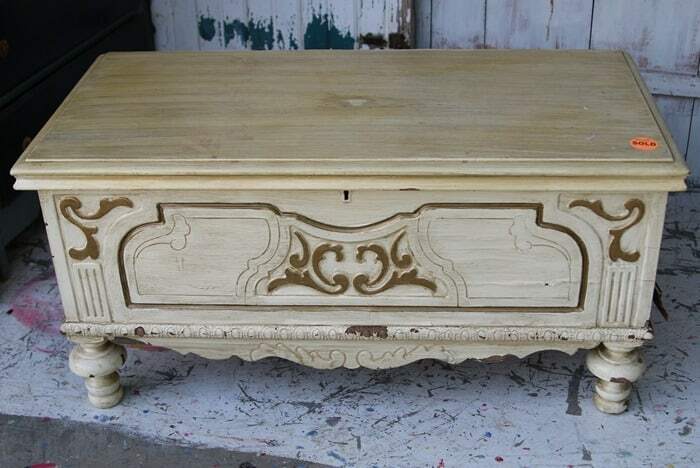 Kathy, I just love this chest. Thanks for posting this technique. Sometimes experience and common sense blend to result into something new and awesome. as you have done. I would love this chest in my home.